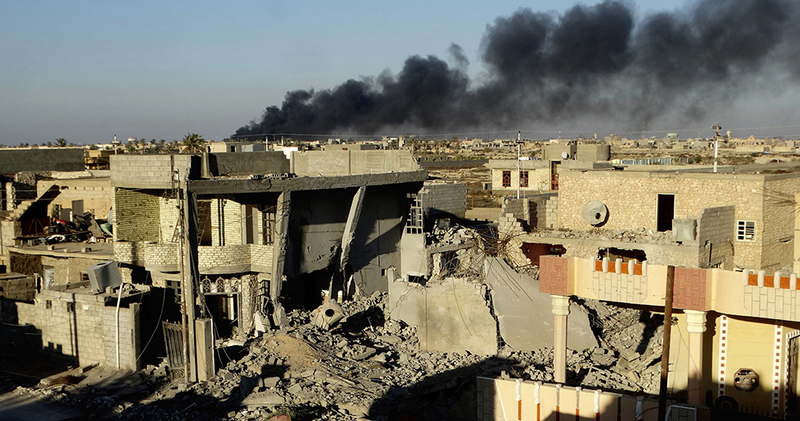 Smoke rises from Islamic State positions following a U.S.-led coalition airstrike in support of Iraqi forces advancing in downtown Ramadi, Iraq, Dec. 25, 2015. 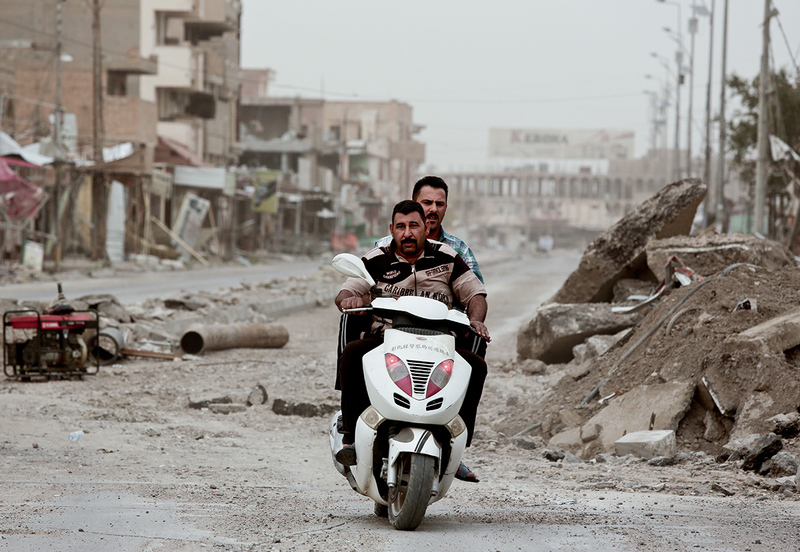 Iraqi policemen ride a motorbike near central Haji Ziad Square in Ramadi, March 20, 2016, weeks after fierce battles between Islamic State militants and Iraqi security forces for control of the city. A building that housed a pool hall and ice cream shops — reduced to rubble. A row of money changers and motorcycle repair garages — obliterated, a giant bomb crater in its place. The square’s Haji Ziad Restaurant, beloved for years by Ramadi residents for its grilled meats — flattened. The restaurant was so popular its owner built a larger, fancier branch across the street three years ago. That, too, is now a pile of concrete and twisted iron rods. Now the few signs of life are the soldiers at checkpoints that have been newly painted and decorated with brightly colored plastic flowers. Vehicles pick their way around craters blocking roads as the dust from thousands of crushed buildings drifts over the landscape. Along one street, the only sign that houses ever existed there is a line of garden gates and clusters of fruit trees. The new approach is particularly key as Iraq and the coalition build up to the daunting task of retaking Mosul, Iraq’s second-biggest city, held by IS for nearly two years. “They know they can’t just turn Mosul into a parking lot,” said a Western diplomat in Baghdad who has been present for a number of meetings with coalition and Iraqi defense officials regarding the Mosul operation. The diplomat commented on condition of anonymity because he was not authorized to speak to the press. 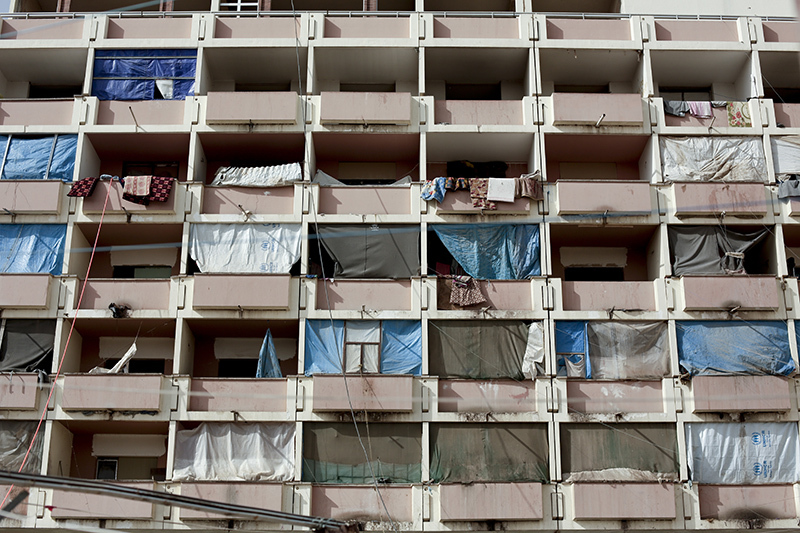 The vast majority of the city’s population remains displaced. Ramadi lies on the Euphrates River west of Baghdad and is the capital of Iraq’s Sunni heartland, Anbar province. Even as IS swept over most of the province and northern Iraq in 2014, Ramadi had held out under tenuous government control. After months of fighting, in May 2015, Islamic State fighters captured it by unleashing a barrage of truck and suicide bombs that overwhelmed government forces. Militants took over homes, converting living rooms into command centers and bedrooms into barracks. They dug tunnels under the streets to evade air strikes, shut down schools, looted and destroyed the homes of people associated with the local government. They set up a headquarters in the campus of Anbar University, on the city’s western edge. 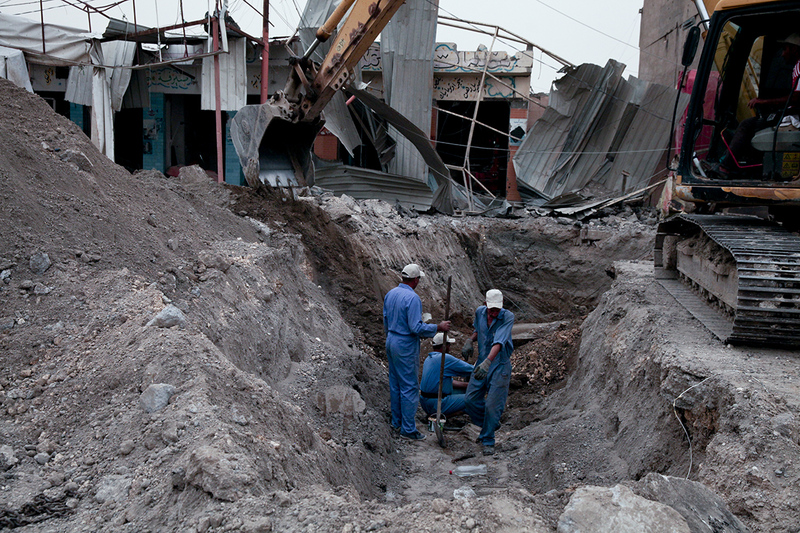 Workers dig a new water line near Haji Ziad Square in central Ramadi, March 20, 2016, the scene of fierce fighting between Islamic State militants and Iraqi security forces. As Iraqi ground forces moved into Ramadi, IS methodically laid explosives and blew up swaths of the city’s infrastructure. The electrical grid was almost completely destroyed and the city’s water network was also heavily damaged. The jihadis bombed the city’s remaining bridges and two dams. Though most of the population had already left, IS fighters tightened checkpoints along main roads out of the city to prevent civilians from fleeing. They later used families as human shields as they made their escape. 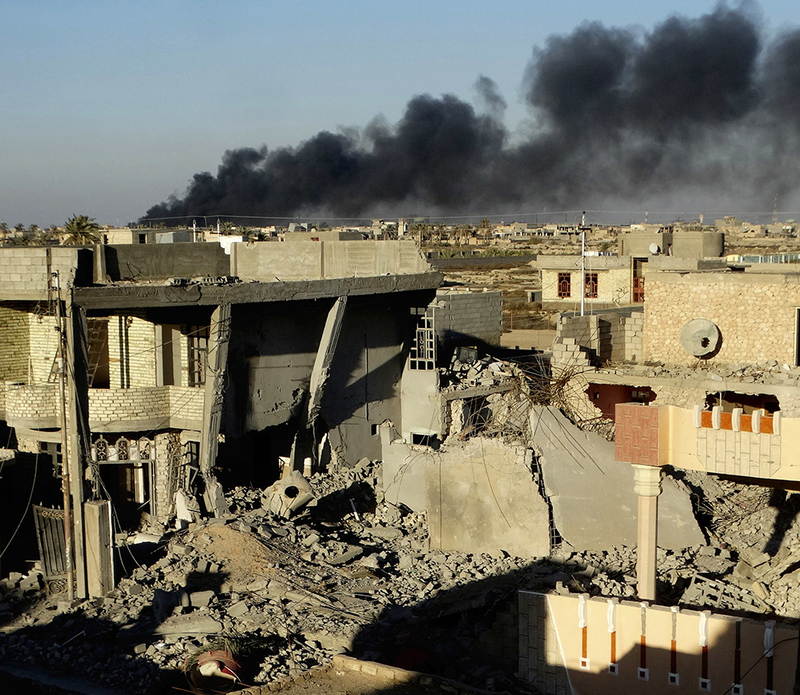 “ISIS made a concerted effort to ensure the city would be unlivable,” said Patrick Martin, an Iraq researcher at the Institute for the Study of War. The complex is now largely destroyed. A gymnasium used by IS to store documents has been torched. Charred sports equipment — a boxing glove, cleats, pieces of a track suit — line the hallways. Iraqi artillery fire punched thick holes into the university’s library. Only the two main reading rooms are safe to visit; the rest of the four-story building is believed to be booby-trapped. 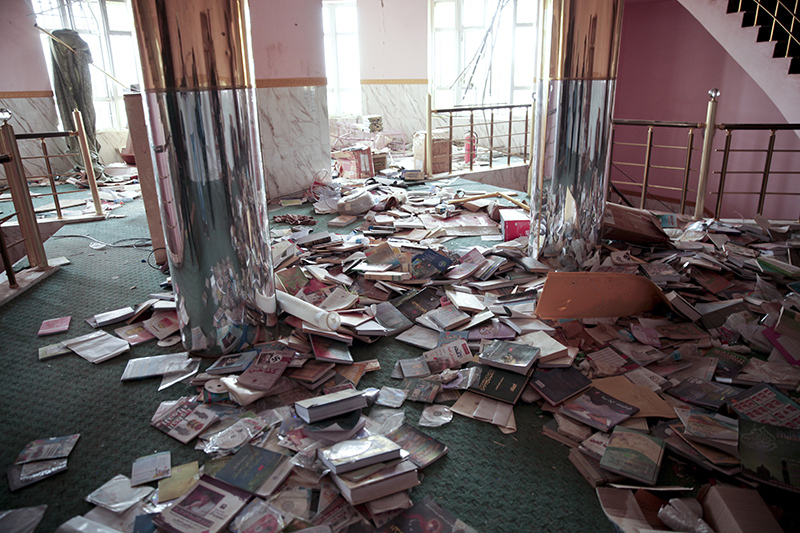 Heavy damage in the library of the University of Anbar in Ramadi, Iraq, March 20, 2016. Islamic State forces burned much of the university complex before withdrawing. 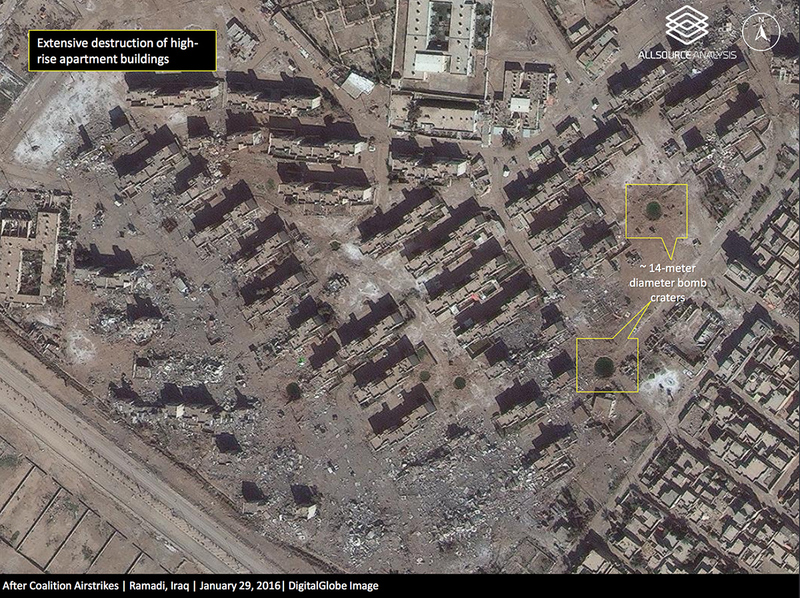 A high-rise apartment complex in Ramadi, Iraq, shows heavy damage and bomb craters in a Jan. 29, 2016 satellite photo provided by DigitalGlobe and analyzed by Allsource Analysis. 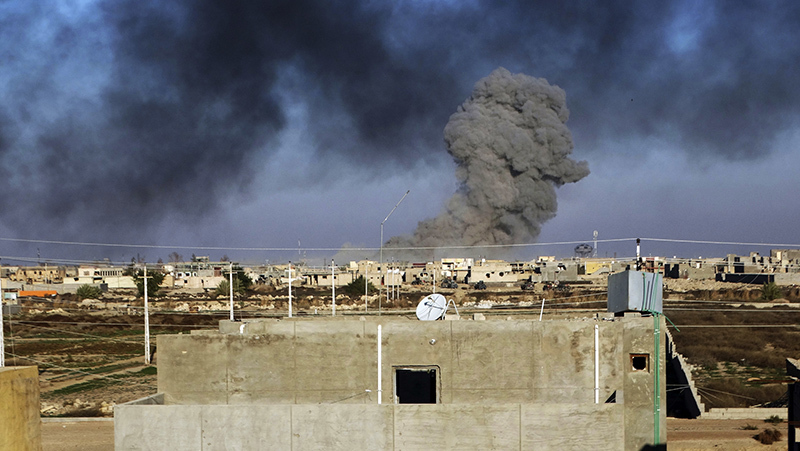 U.S-led coalition airstrikes supported Iraqi security forces retaking Ramadi from Islamic State militants. In a district along the western edge of downtown Ramadi, a dense strip of buildings, homes and bustling shops, not a single building escaped unscathed from the IS occupation and the coalition airstrikes. Key streets throughout the city are blocked by craters as each side tried to hamper the other’s movement. 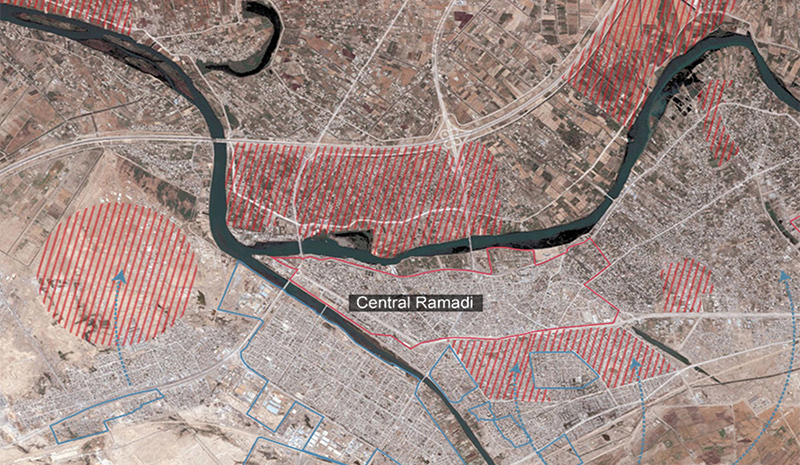 Tens of thousands of Ramadi’s residents live in camps or with extended family in Baghdad. Hundreds of thousands are in other nearby villages. Thousands more live in a small resort town on Habbaniyah Lake south of Ramadi that has become a sprawling camp. Umm Khaled, 30, once lived with her family in a two-bedroom home in Ramadi’s center. Now, pregnant with her fourth child, she lives in a small shelter on the edge of the Habbaniyah resort that her husband built with corrugated metal and plastic tarps. “It was like there was nothing. And it’s not just our house — the entire neighborhood,” said Umm Khaled, (resident whose home was destroyed in the battle to retake Ramadi) who did not want her full name used because she feared for the safety of family members still living under IS rule. A hotel on the shore of Lake Habbaniyah shelters thousands of people who fled the Islamic State group in Anbar province, March 21, 2016. According to the United Nations’ satellite mapping agency, UNITAR, an estimated 5,700 buildings out of the city’s total of around 55,000 were seriously damaged or destroyed. 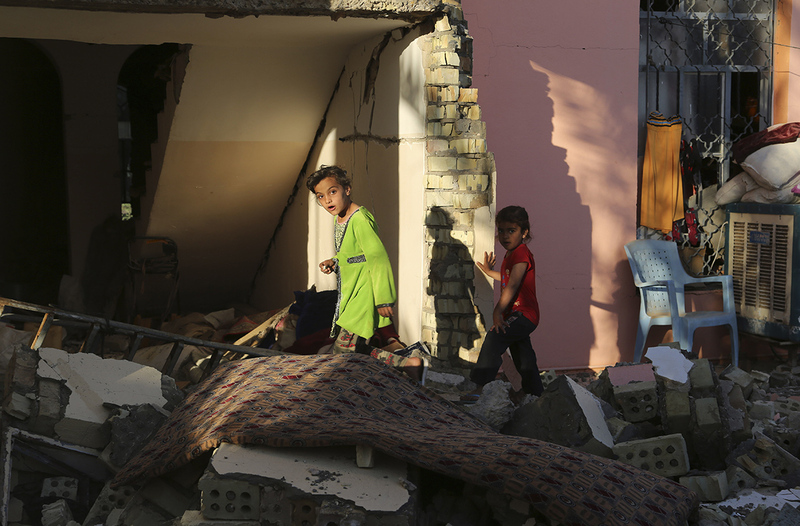 Jinat Ali, 7, center, and her sister Aya Ali, 5, walk through the rubble of their destroyed home as they come back to their hometown of Ramadi, Iraq, April 3, 2016. “Our allies have their own standards, their own regulations,” al-Aradi explained, implying that Iraqi planes would have used airstrikes more liberally. Mosul is roughly two-thirds larger in area than Ramadi, and some 1 million to 1.5 million residents are still in the city — a far higher number than those who were in Ramadi as Iraqi forces fought to regain it — putting large numbers in harm’s way when an assault is launched. The destruction of Mosul on the same scale as Ramadi would result not just in billions of dollars of damage. It also would risk further alienating the Sunni minority population. Long oppressed under the Shiite-led central government in Baghdad, some Sunnis originally welcomed IS fighters into Mosul and parts of Anbar province. But after months of increasingly brutal IS rule, the group’s support among Sunnis appears to have eroded. Widespread destruction also can spark cycles of revenge attacks within Anbar’s communities, where tribal law often demands death and destruction be repaid in “blood money.” In Ramadi’s eastern edge, local security officials have already begun methodically razing homes of suspected IS sympathizers. Hamdiya Mahmoud’s family home was destroyed by IS militants. Amid the rubble that was once her son’s bedroom, she points to a dresser showered with shards of plaster and concrete that was a gift to her son and his wife on their wedding day. “I didn’t let my youngest son go to school to save money to build this house,” Mahmoud said, breaking into sobs, “This house is really priceless to me, it’s like one of my sons.” Mahmoud said she would not seek revenge for the damage done to the property. But as her husband looked over the ruins of his house, he was less forgiving.